Five Day comprehensive tour of the Scottish Highlands giving you a real insight into the nature, history and scenic beauty of Scotland. The perfect balance of exploration, travel and hospitality combine with Scotland’s nature, history and scenic beauty for five wonderful days in the Scottish Highlands. From Edinburgh we make our way to Glasgow then let the Kilpatrick Hills lead us to the "bonnie, bonnie” banks of Loch Lomond. This is Britain's largest lake and one of the most beautiful in Scotland. The loch has 23 islands, one of which is inhabited by a colony of wallabies. We continue along the banks of Loch Long to the Argyll Forest Park then climb the "Rest and be Thankful” mountain pass to Loch Fyne. Inveraray sits at the head of Loch Fyne and was built by the third Duke of Argyll. The town sits in the shadow of his castle and retains much of its 18th-century charm. Soon we enter Kilmartin Glen, which has the largest concentration of pre-historic sites in Scotland. It's not far to Dunadd, an Iron Age hill-fort which was the capital of the ancient Kingdom of Dalriada. This part of Argyll has played an important part in the creation of modern Scotland. Our scenic drive continues through Kilmelford and onwards to Oban, our home for tonight. We leave Oban behind then cross the Connel Bridge and as we do look out for the Falls of Lora below. We then travel by way of Loch Etive and the Appin Hills to Ballachulish. Glen Coe is probably Scotland's best known valley, partly for its breathtaking beauty but also because of the infamous massacre it witnessed in 1692. Fort William has superlative setting on the banks of Loch Linnhe and in the shadow of Ben Nevis, Britain's tallest mountain. This unique background has made it a popular tourist destination since the days of the steamships in the mid-1900s. Next we join the Jacobite Steam Train for a trip on the scenic West Highland Line#. Described by aficionados as one of the great rail journeys of the World we'll cross the famous 21 arch Glenfinnan Viaduct, made famous in the Harry Potter movies and see the silvery beaches of Morar, used in the films "Highlander” and "Local Hero”. The end of the line is the fishing village of Mallaig where you'll be able to sample excellent seafood before boarding a modern ferry to sail "Over the sea to Skye”. On arrival it's a short drive through the Sleat peninsula to our accommodation in the village of Kyleakin. After breakfast we board our coach for a day of island exploration. The landscape changes dramatically from the villages and restful scenery of the southern part of the island as the Cuillins, amongst the finest hills in Britain, rise before us. Dun Beag Broch is a defensive tower that dates from the first millennium. The massive walls are largely intact and all it takes is a little imagination to visualise how impressive this building would have looked when it was first built. Take a short stroll to enjoy great views over to Loch Bracadale. Dunvegan Castle * has been home to the MacLeods for over 700 years and sits on a rocky platform overlooking Loch Dunvegan. The castle is home to a wealth of paintings, books and relics including a lock of Bonnie Prince Charlie’s hair and the fairy flag, said to have magic properties. Picturesque Portree is the Skye's largest community and hugs its natural harbour. Portree means "King's Port", following a visit by King James V in 1540. There is time to explore the centuries-old charm of the attractively painted houses around the harbour or browse the interesting shops in Sumerled Square. Our excursion continues to the famed Trotternish Peninsula. We travel northwards to the quaint ferry port of Uig, where ferries sail to the Outer Hebrides. See the monument at Kilmuir to Flora MacDonald, who famously helped Bonnie Prince Charlie evade the Government Troops who were searching for him. Dressed as her maid the Prince escaped "over the sea to Skye” and eventual freedom. We stop at The Quiraing, a dramatic terrain formed by a landslide, here you can stroll through a landscape that dates from Jurassic times and look out for the rock formations known as the ‘Needle', ‘Table' and ‘Prison'. Our coach then takes us the short distance to Kilt Rock, so called as the rock's basalt columns resemble the pleats of a kilt. There's time for a particularly Scottish photo opportunity before heading back to Kyleakin. We bid farewell to the Isle of Skye and return to the mainland. Our first visit will be to picturesque Eilean Donan Castle*, one of Scotland's most iconic sights. There will be time to visit the castle or to take a stroll to capture the best image to post on your timeline. Next we travel through Glen Carron to enjoy wonderful views over Loch Carron. The scenery continues as we make our way into Glen Docherty which has great views over Loch Maree, considered by many to be Scotland’s most beautiful lake. Inverewe Gardens* provides a sumptuous collection of sub-tropical plants, growing, thanks to the Gulf Stream, on the same latitude as Siberia! We’ll make a stop so you can discover this marvel of nature for yourself. Our journey continues along the shores of Gruinard Bay with its coves of pink sand, said to have been created from sandstone over 800 million years old. The last visit of the day will be to the dramatic Measach Falls which cascade 35 metres into Corrieshalloch Gorge below. The last part of our tour brings us to Loch Ness and our accommodation in the little village of Fort Augustus. From Fort Augustus we’ll make the drive along the banks of Loch Ness to the picturesque ruins of mighty Urquhart Castle. There’s time to visit the castle * or to take to the waters for some ‘Nessie' spotting on a short loch cruise *. Later we make the short drive to Inverness, the Capital of the Highlands. Culloden Moor * was the scene of the last battle ever fought on British soil, when Bonnie Prince Charlie and his Jacobite troops were routed by the British army under the command of the Duke of Cumberland. We stop here so you can discover more about the battle and its dramatic consequences for the Highlands. The wild mountain scenery continues as we descend the Drumochter Pass, the main route to and from the Highlands for centuries. There are also fine views of Blair Castle, the seat of the Duke of Atholl, the only man allowed his own private army, The Atholl Highlanders. We make a stop for afternoon coffee in Pitlochry amidst wonderful scenery, with time to visit the popular salmon ladder which allows thousands of fish to by-pass a Hydro-Electric dam. From the scenic valleys, remote glens, rushing rivers and peaceful lochs of Perthshire we head to journeys end in Glasgow and Edinburgh. # Departures between 16 May and 29 August, 2016 will include the Jacobite Steam Train. When the train is not operating a cruise on Loch Ness and admission to Urquhart Castle will be included instead. 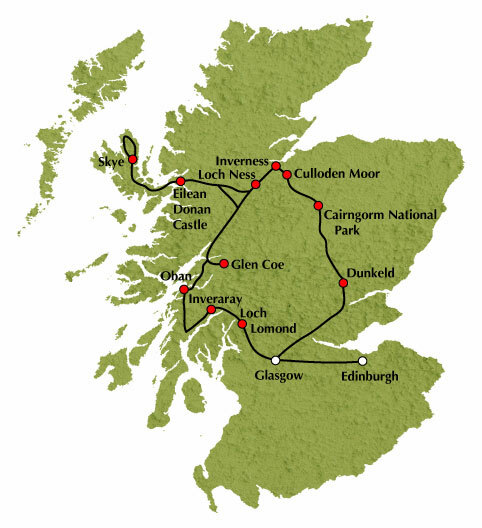 Tour Highlights: Loch Lomond, Inveraray, Kilmartin Glen, Oban, Glen Coe, Fort William, Jacobite Steam Train, Isle of Skye, Cuillin Hills, The Quiraing, Eilean Donan Castle, Loch Maree, Inverewe Gardens, Loch Ness, Culloden Moor, Cairngorm National Park, and Pitlochry.